For the former town in Madera County with this name, see Willow Glen, Madera County, California. Clockwise: Garden Theatre, WG Stone Church, and Willow Glen Branch of the San José Public Library. Being a city, however, required thinking about issues such as sewage. Willow Glen had no sewer system – individual homes had their own cesspools or septic systems. Because the area was marshy before being drained for Willow Glen, the high water table resulted in raw sewage often spilling above-ground from flooded cesspools. Rather than build their own very expensive sewage treatment system, in 1936 Willow Glen's residents opted to be annexed to San Jose and be linked to San Jose's sewage system, the measure passing by a vote of 17 to 38. "Willow Glen" was named for the marshy wet area between the Guadalupe River and Los Gatos Creek. The soggy land tended to produce vegetation like willows and cattails that are somewhat unique to the immediately surrounding area. As both waterways run south to north, the marsh was damper and less viable for planting and grazing year-round north toward the fork. What was historically called 'Willow Glen' would have actually originated at its northernmost point where the Los Gatos Creek runs into the Guadalupe River. This is the approximate site of the SAP Center in downtown San Jose today and would not be considered part of the Willow Glen neighborhood. Over time, the historical community developed between the Guadalupe River and Los Gatos Creek, roughly two miles south of the point where they intersect, and beneath what is today Highway 280. The modern community was largely founded by Frank Lewis and Isaac Bird (the namesake of "Bird Avenue"). Lewis noticed the potential of the marsh for raising crops and orchards, and in 1860 dug the channel between Willow Street and Curtner Avenue that carries the Guadalupe River to this day. That channel effectively drained the marsh and opened Willow Glen for farming. In turn, Bird started farming hops on the newly available farmland and found instant success producing some of the best hops and barley in the region. Bird's continued success brought fame to the region among local growers. By the late 1800's, Willow Glen was generally considered one of the most ideal spots in all of Santa Clara County for raising wheat, barley, hay, tobacco and hops. By 1880, plots of Willow Glen farmland were priced nearly 10% higher than similar plots in other parts of the county. Then, in 1886, extreme flooding of the Los Gatos Creek caused it to naturally cut a new channel running far west around what was traditionally considered Willow Glen. The reshaped creek left behind a dry creek bed, known as the "Dry Creek," and opened up Willow Glen for greater southwest expansion. Map of Willow Glen's neighborhood boundaries. Willow Glen includes areas within zip code 95125, though not all of the zip code area can actually be considered to be part of the Willow Glen neighborhood, and there are areas within the 95126 zip code that many people would consider to be part of Willow Glen. Willow Glen has no officially defined boundaries, and area residents have been known to debate where the neighborhood ends. The Willow Glen Neighborhood Association's by-laws reserve voting memberships to individuals and businesses within boundaries of the Association defined by the San Jose 2009 Greenprint - Willow Glen Planning Area Map, and within 1/2 mile of Greenprint boundary. Highway 280 is almost universally accepted as the community's northern border. The Guadalupe River was the original, natural, eastern border of Willow Glen during its time as a municipality while the Los Gatos Creek originally served as a natural western end for the community. Willow Glen neighborhoods are almost exclusively composed of custom or semi-custom homes in a diverse range of architectural styles. Many architect-commissioned houses can be seen in the neighborhood, including Victorian, Neoclassical (Queen Anne Cottage and Neocolonial), Colonial Revival, Craftsman, Mission, Prairie, Spanish Eclectic, Eichler Homes, and Tudor. In recent years many smaller houses have been replaced with larger houses. Dancin' on the Avenue (DOTA) is Willow Glen's annual street party that occurs on one day in summer. It is celebrated along Lincoln Avenue, between Willow Street and Minnesota Avenue. The event is organized by the Willow Glen Business Association. Founders' Day occurs in September although it has not been celebrated every year. The event celebrates the rich history, cultural heritage, and progressive present of the neighborhoods, homes, and community of Willow Glen. The highlight is a festive parade that proceeds down Lincoln Avenue. The origins of Founders' Day are not known. Archives of the Willow Glen Resident newspaper indicate it originates from the area's nine years of independence from San Jose between September 8, 1927 and September 4, 1936. Another view is that it celebrates the work of Antonio Maria Sunol who built Laura Ville in 1847. Willow Glen residents have a distinct Christmas tree decoration tradition. This tradition involves buying similar, very small, Christmas trees and placing them in the front yard ten feet from the sidewalk with multicolored lights. People and businesses in the neighborhood generally make significant decorations every year, both within the neighborhood and in the Lincoln Avenue business district, drawing visitors from all around the area. The tradition of a Christmas tree on each residence's lawn was started in 1950 by Robert and Arlene Cimino. Trees were purchased in bulk from the Knights of Columbus and delivered to participating homes. The Ciminos moved from the area in 1956 and the tradition was continued by Frank Badagliacca, Jr. Hi wife, Dolores Badagliacca, came up with the idea of putting a single white light on the top of each tree. The tradition now stretches to over 200 streets in the greater San Jose area. Although no railway stations exist within Willow Glen, the area is served well by VTA light rail and Caltrain stations on or near its borders: Fruitdale, Race, Curtner, Tamien, Diridon, and Virginia. The two sections of the Los Gatos Creek Trail terminate in Willow Glen. The connection requires on-street travel through much of Willow Glen. One section of the Guadalupe River Trail terminates near the far north east edge of Willow Glen but otherwise does not run through it. The Highway 87 Bikeway runs along the eastern edge of Willow Glen but terminates at Willow Street at its most northern point. The Three Creeks Trail runs diagonally through Willow Glen and passes close to downtown. ^ "The History of San Jose's Willow Glen District, downtownwillowglen.org". Archived from the original on 2007-09-12. Retrieved 2007-04-18. ^ Ken Eklund (February 2003). "What Style is my House?". Retrieved 2013-08-10. 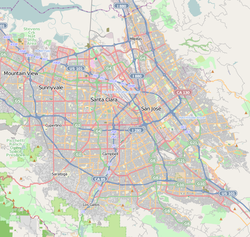 Wikimedia Commons has media related to Willow Glen, San Jose, California. This page was last edited on 20 September 2018, at 07:23 (UTC).